Blocking is a helpful treatment option hoof care professionals can use for dairy cows to elevate an affected claw off the ground. With a block in place on a healthy claw, an affected claw has the necessary elevation and comfort to heal properly. While applying blocks can help maintain milk production and ultimately save money, it’s important for hoof care professionals to also position blocks correctly. For a cow’s optimal safety and comfort, hoof care professionals should first consider the size of the block they use on their cow. Think of a block like a shoe. Similar to how a shoe fits on a human foot, with the shoe not extending far past someone’s heels or toes, a block should fit the length of a dairy cow’s foot. If a block doesn’t fit the foot properly, it can put the cow at risk for injury. For instance, many times dairy cows will walk in a single file line when taking trips to the parlor. If a block is too long past a cow’s heel, the cow behind it could step on the block from behind and rip off the block, not only causing pain for the cow but an added hassle for dairy farmers. It’s ideal to position a block just past the weight-bearing part of the heel. This technique provides a soft cushion on the heel and prevents it from striking the ground, similar to a runner’s heel coming into contact with the hard ground. If a cow’s heel is not lined up with a block, the strike on the heel could eventually lead to tendon damage. Another tip to consider is the positioning of the block at a cow’s toe. If the block is too long beyond the toe, it forces the cow to walk straight on the heel which can also cause bruising or injuries to the tendon. Again, it’s best if the block fits a cow’s foot like a shoe to keep them from developing injuries. 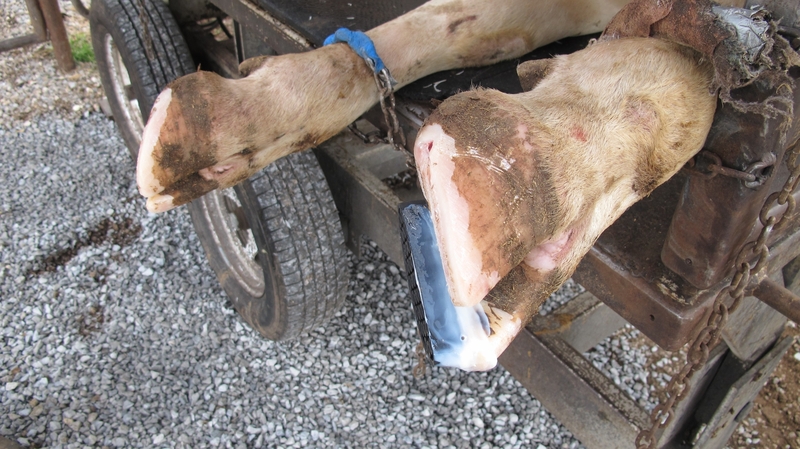 When applying a block, hoof care professionals should line it up at a 90-degree angle with the inside of a cow’s leg. This helps to keep the foot from rocking left to right, and instead holds it securely in place. Once the block is positioned correctly on the foot, a quarter inch of glue is just enough for the block to stick and stay. Using an excessive amount of glue acts similarly to a peanut butter sandwich with too much peanut butter. If too much glue is applied, the material oozes out the sides and goes to waste. 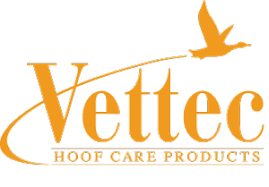 For best results, hoof care professionals should only apply the necessary amount of glue to hold the block to the foot firmly. It’s also crucial to be aware of how the glue dries. Keeping the spread of adhesive even across the block will ensure the glue dries smoothly and will avoid sharp edges that could stab into the cow’s heel and cause discomfort. In terms of which blocks to apply to a cows’ hooves, rubber blocks from Bovi-Bond™ provide the necessary traction and cushion hooves need for a dairy cow to stay safe and comfortable. Whether a cow is spending its time on lush grass, soft or hard dirt, gravel or concrete, Bovi-Bond rubber blocks add give and help avoid the potential for slippage and injury while allowing an affected claw to heal. Depending on the cow’s sole thickness, there are different adhesives that hoof care professionals can use to attach the blocks onto the claws. Bovi-Bond adhesives are proprietary two-part polyurethane adhesives that bond both wood and rubber blocks. They have a fast, 30-second set time and a strong bond to keep blocks in place. The feet and claws support a cow’s entire body weight. When a cow injures a claw, blocks must be applied correctly in order to support the healing process as opposed to elongating it with the potential for more injuries. Talk to your hoof care professional about the importance of applying blocks properly.